Summer has hit New York in full force and that means I am drinking a lot of gin. A lot of people will say that gin is nothing more an infused vodka. While I do not believe gin can be distilled (!) that easily, I see their point. Gin is a neutral spirit infused with botanicals, such as juniper, coriander, citrus peels. etc. The character of gin varies greatly depending on which botanicals the distiller chooses to use. Knowing the general character of these botanicals (floral, fruity, etc.) allows for the addition of components which complement the gin. I commonly use cucumber in gin drinks. 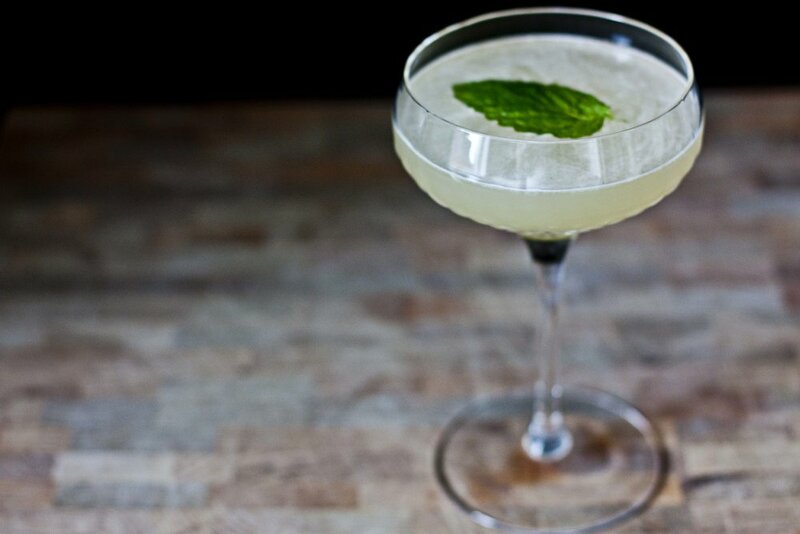 The Juliet & Romeo goes further and adds not only mint, but rose water, to create a great and complex summer drink. Lightly muddle cucumber, salt, and mint. Add remaining ingredients. Let sit for 30 seconds (time allowing). Shake with ice. Strain into a chilled coupe glass. Garnish with 1 floating mint leaf and 1 drop rose water on top of leaf. Rose water is commonly used in Indian and Middle Eastern food. I grew up loving rose ice cream. However, most people find the idea of eating something rose flavored odd. Rose water is essentially a distillate of rose petals. It is the by-product of removing rose oil, a common component in perfumes. Rose water maintains some essence of the rose petals, and the addition of it in very small quantities provides floral depth to food, and in this case a drink. You can find it in any Indian or Middle Eastern grocery store. I recommend purchasing a dropper bottle to use it as you will likely end up purchasing a larger bottle which is difficult to titrate. The Juliet & Romeo is a wonderful drink which makes me want to use rose water in more than just food. It is light and floral and perfect to sip on a hot day. If you have the patience (I know it's hard) try to wait the 30 seconds in the directions. The reason you want to wait is that the salt will extract flavor from the cucumber and mint. You will be rewarded with a drink which will leave you wanting more. Enjoy!